The program Los Reporteros will feature the Destination from August 1-5, 2016 within the prime time newscasts headed by Joaquín López Dóriga and Carlos Loret de Mola, as will the Por el Planeta show on Foro TV on August 6 and 7, which will include a documentary on the Riviera Nayarit that will also be available on Blim the last week of July 2016. 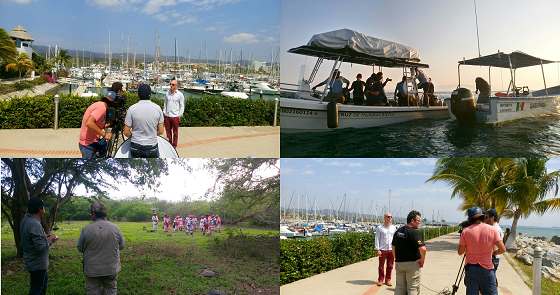 The natural and cultural riches of the Riviera Nayarit will be on full display on national television and the Internet via different programs on Televisa, thanks to a visit to the Destination by teams from Los Reporteros and Por el Planeta. The Public Relations office of the Riviera Nayarit Convention and Visitors Bureau (CVB) organized the activity together with journalist Alberto Tinoco Guadarrama, who produces and hosts both shows. Ten-minute capsules on the Riviera Nayarit will air daily from August 1-5, 2016 on the Los Reporteros program within the award-winning newscast hosted by Joaquín López Dóriga and Carlos Loret de Mola. Foro TV’s Por el Planeta program will showcase Mexico’s Pacific Treasure from August 6-7, 2016 in a one-hour documentary that will later be available without commercial interruption on the last week in July of this year on the AV platform, Blim. The Huichol culture and natural attractions such as the whale shark, the manta rays, the humpback whales, the boobies and other species will headline these special programs, as filmed by the Televisa’s producers during and after their visits to La Isla Isable and Las Islas Marietas.